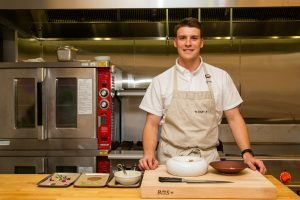 Crafting new foods and flavors that help Northwest grains and chefs thrive, Niels Brisbane is culinary director of the Bread Lab, Washington State University’s center for research on bread and grains. (Photography by Suzi Pratt). As the first culinary director of the Bread Lab — Washington State University’s Burlington-based research center for bread and grains — Niels Brisbane is pioneering foods and flavors that help Washington farmers, chefs and communities thrive. Hired earlier this year, the former sous chef at Seattle’s landmark Canlis restaurant develops dishes that bring Bread Lab discoveries and the agricultural bounty of Northwest to the world. A 2018 winner of Eater’s Young Guns award, Brisbane researches dishes that highlight WSU grains bred for Northwest farmers and chefs. He’s also helping connect the region’s culinary community with the farmers who grow our food. “Niels really broadens the reach of our work,” said Kim Binczewski, managing director of the Bread Lab. Grains are just one part of the local agricultural and food economy, which the lab’s discoveries support far beyond bread and beer. “Niels is here to help us showcase all of that variety to the greater Seattle community, as well as the farmers of Skagit and Whatcom counties,” Binczewski said. Brisbane creates unique northwest flavors at The Bread Lab, such as an aged shiro miso made from local barley. Brisbane’s role at the Bread Lab is funded by a gift from Canlis, where he worked for the past four years. Brisbane specialized in researching new menu items: connecting with local farmers and artisans to create compelling new dishes. He brought fellow Canlis chefs to the Bread Lab for regular visits. The recipe for miso dates back to ancient Japan. But the barley and beans fermenting under a heavy bucket in Brisbane’s kitchen laboratory are pure Skagit County. Barley isn’t as valuable as other cash crops, but regional growers rely on it as an important rotation crop that breaks up weed and disease cycles. Brisbane’s miso is one of the ways he’s finding new, valuable uses for barley, helping growers solve a challenge while giving chefs a new dish with an interesting Northwest spin. Fermenting local barley with Koji, a fussy mold that requires precise temperature and humidity and frequent stirs, Brisbane presses the paste of local grains, beans and salt in buckets to age comfortably for months or years. “Time does the rest,” Brisbane said. The end result is earthy, aromatic and slightly sweet. 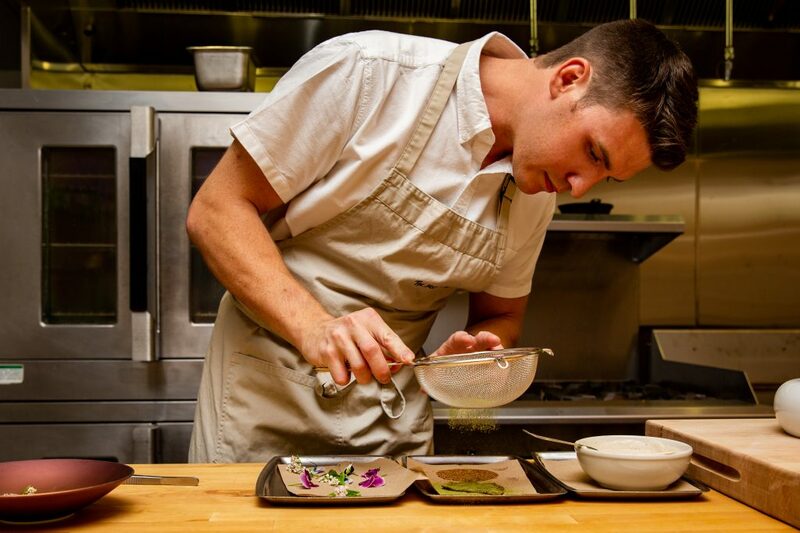 Brisbane suspects he may the only chef in Washington state crafting his own miso. Nearby is a bottle of experimental maraschino cherries. The locally bred Black Republican cherry grows fruit that’s too small to sell commercially. It’s really only used to pollinate more popular varieties like Bings and Rainiers. “I want to find better ways to preserve its fruit,” said Brisbane, giving cocktail and dessert makers a tiny, purple topper. As a chef, Brisbane loves working with farmers to find foods that are unique to the Northwest and help dishes stand out. That’s what makes cooking special, he said.